Raspberry Cream Take a pint of cream & when it boils put to it 3/4 of a pint of raspberry juice sweetened & keep stirring it till thick. 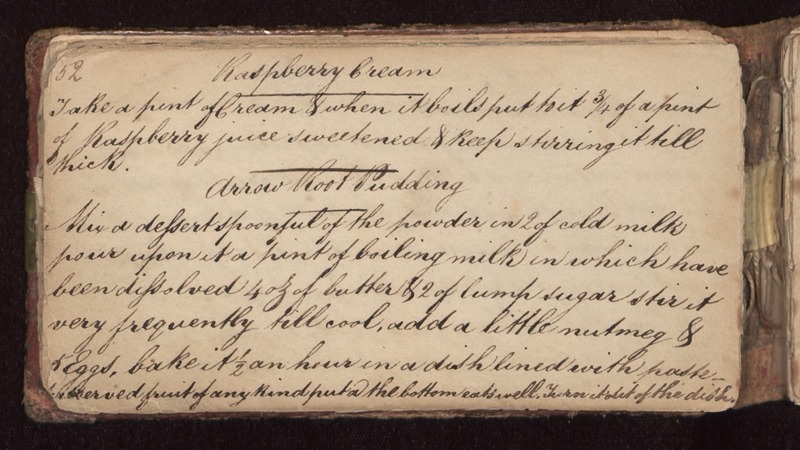 Arrow Root Pudding Mix a dessert spoonful of the powder in 2 of cold milk pour upon it a pint of boiling milk in which have been dissolved 4 oz of butter & 2 of lump sugar stir it very frequently till cool, add a little nutmeg & 5 eggs, bake it 1/2 an hour in a dish lined with paste - preserved fruit of any kind put in the bottom eats well. Turn it out of the dish.